Danny Galieote has a propensity for capturing the quintessentials of Americana in works that blend realist narratives with a pop sensibility. The works are reminiscent of classic, vintage postcard imagery with an undercurrent of poetic, and often surprising, juxtaposition. The stylistic effect is a blend between the old-school charm of Norman Rockwell, with the unexpected twist of surrealist René Magritte. JoAnne Artman Gallery is pleased to present an exhibition of new works by Danny Galieote with a focus on iconic American summertime scenes. Galieote belongs to a group of contemporary artists and writers that are part of a revitalized interest in American regionalist history and art. The American Regionalist art movement rose in the 1930s as a response to the Great Depression and was defined by a traditionalist realist style that appealed to popular American sensibilities of the time. The movement gave rise to a subsequent proliferation of realist art, making a lasting impact as a style that bridged academic realism with American Modernism, breaking American realist art away from the European tradition. 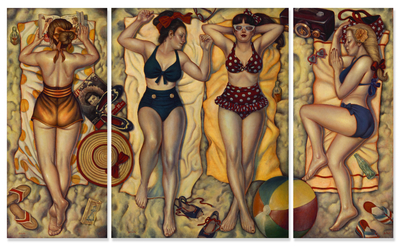 Danny Galieote’s masterfully rendered paintings tie the stylistic and thematic trends of the Regionalists to contemporary socio-cultural themes. Rendered in a faded, tonal palette, Galieote builds his compositions with references to classic Americana, presenting quotidian scenes of American life. Focusing on the figure, Galieote sets his compositions in the the iconic decades of mid-century America, incorporating whimsical elements with modern social concerns. Many of the scenes include psychological elements such as hints at the inner, intrusive thoughts of the figures, imbuing the light hearted imagery with deeper connotations and illuminating timeless truths of the dualities of human nature. A California native, Galieote began his art career in Disney animation studios, where he was a top animator for films such as the Lion King and Tarzan as a character artist, honing his skill at hand drawing and the human figure. Well versed in art history, Galieote’s influences include Renaissance masters such as Michelangelo, Rubens, and the Mannerist Jacopo Pontormo as well as American realist painter George Bellows and other AshCan artists. Galieote’s work has been widely exhibited across the U.S., with numerous works in prestigious international collections. He currently lives and works in Los Angeles. Danny Galieote’s work will inspire, provoke, engage and mesmerize. With visual perceptions always changing, peek behind the stories told and you're sure to find the right artistic expression!